The Police in the United Arab Emirates (UAE) say they have arrested five Nigerians who “stormed a money exchange in Sharjah and fled with Dh2.3 million”. According to Dubai-based newspaper Khaleej Times, the men barged into the exchange and smashed the glass barrier between the customers and the staff, stole the money in multiple currencies and fled. When converted, the money amounts N225.4million. Two employees at the exchange were injured as they resisted the robbers, one of them eventually managing to notify the Police. The paper aid the Sharjah Police coordinated with forces from Abu Dhabi, Ras Al Khaimah and Ajman to nab the suspects from four emirates within 48 hours after the robbery was committed. The incident was reported at Al Ansari Exchange in Al Tawoon area, a top police official saying the suspects came to the UAE on visit visas on March 18. For two days, they studied the exchange office before deciding to commit the robbery around midnight — just before the shop was to close. On March 20, four suspects stormed into the exchange office, while one waited in a car outside. After the four suspects rushed out with the money, they fled in a car. Major-General Saif Al Zeri Al Shamsi, Commander-in-Chief of the Sharjah Police, said the whole amount had been recovered. The police retrieved the number plate of the car in which the suspects fled. One of the suspects was arrested in Sharjah, after which he led the police to the others — two in Ajman, one in Abu Dhabi and one in Ras Al Khaimah. All the suspects were said to have confessed to the crime. A Kenyan man, Jervason Musinga Kiendi, 33, who went to a police station to report a case of robbery was shocked to see the robbers behind the police reporting desk. Kiendi accused the three policemen, who were in a saloon car of seizing him moments after he withdrew cash from a bank in Machakos town on Friday. Kiendi, 33, said they robbed him of Sh390,000 (N139,978) and dumped him in a bush in Konza. However, when he went to Machakos Police Station to report the incident, Kiendi claimed he found two of his attackers at the station, and they refused to record his statement. He returned to the police station the next day and found the third man he claimed was part of the gang that robbed him manning the reporting desk. The policeman allegedly kept him waiting in the reports office. He then went to Salama Police Station in Makueni County where he made the report. In the statement he made in Salama, Kiendi said he withdrew Sh400,000 from Equity Bank in Machakos around midday on Friday and immediately spent Sh10,000. Later, as he walked from the bank to the local referral hospital, a saloon car with three male occupants stopped at the hospital gate. The men bundled him into the car, threatened to shoot him and took him to the Machakos-Konza road, where they dumped him after robbing him of the money. Kiendi told police a good Samaritan offered him a lift from the robbery scene to Machakos Police Station. “He says he found two of the men who robbed him of the money at the office where he went to report in civilian clothes. He alleges he tried to make a report on the incident but was told to wait outside until late in the evening,” said an officer aware of the matter. Machakos County police boss, Samuel Mukinda, said they had opened investigations into the claims. “We intend to visit the bank to confirm if he withdrew the money and conduct a thorough probe before we establish a way forward,” said Mr Mukinda. A 20-year-old-man, Danladi Auwalu and Yusuf Auwalu, 18, have been remanded in Katsina Prison for alleged robbery. Northern City News learnt that the suspects were arrested for allegedly attempting to rob one Mati Shehu and his friend, Ibrahim Isah, at Babban Rafi Village, Danja Local Government Area of Katsina State. The suspects with others at large were said to have attacked the victims who were riding on a motorcycle along Danja/Kano village road. However, one of the victims, Shehu, reportedly overpowered one of the robbery suspects, Danladi, and dragged him to the police station. Another member of the robbery gang, Yusuf, was later arrested following police investigation. Danladi and Yusuf were arraigned before a Katsina Senior Magistrates’ Court last Friday. They charges against them included criminal conspiracy, attempt to commit armed robbery and illegal possession of firearms. Police prosecutor, Inspector Sani Ado, said the offences committed by Danladi and Yusuf were contrary to Section 6(b), 2 and 3(1) of the Robbery and Firearms Special Provision Act, Cap R11, LFN, 2004. Ado, however, said investigation into the case was still in progress. The presiding magistrate, Hajiya Fadila Dikko, noted that the charges against Danladi and Yusuf could only be tried by a high court. The Lagos State Police Command has arrested Peter Odion, the chef of a former Minister of Finance, Dr Kalu Idika, for his involvement in the robbery of his boss. Odion lived with the ex-minister at 180A, Moshood Olugbani Street, Victoria Island, Lagos. He had allegedly put some sedatives into a cup of coffee he served the ex-minister on a Wednesday morning. After Idika slept off, Odion was said to have led his gang members into the boss’ apartment, where they made away with a sum of N750,000, a Blackberry, a Samsung phone and other valuables estimated at about N10m. Odion was paraded on Monday at the police command office in Ikeja along with four others identified as Samuel Ogana, Joy Omagu, Uboh Obi and Sunday Emmanuel. The state Acting Commissioner of Police, Edgal Imohimi, said operatives of the State Intelligence Bureau, tracked down the suspects. The CP said the gang members had wanted to adopt a similar method to rob one Mrs. Augustina Akhibi, when they met their Waterloo. He said, “The syndicate is made up of six members who specialise in getting jobs as cooks or home helps and while in service, gain the trust of their principals and inject their food with drugs to make them sleep off. They thereafter cart away their principals’ belongings. The chef, Odion, who admitted to the crime, told PUNCH Metro that he was desperate to get a sum of N60,000 his boss allegedly owed him. Twenty-year-old Omagu said Emmanuel acted as an agent and contracted her as a housemaid to Akhibi. “He gave me some sedatives to make the woman sleep, but I had not used them when the police arrested me,” she added. But 38-year-old Emmanuel denied that he gave the drugs to Omagu, noting that he had got a housemaid for the woman in the past. Highway robberies may have taken a turn for the worse after a police sergeant, Williams Godwin, was allegedly involved in the robbery of a commuter identified only as Henry. 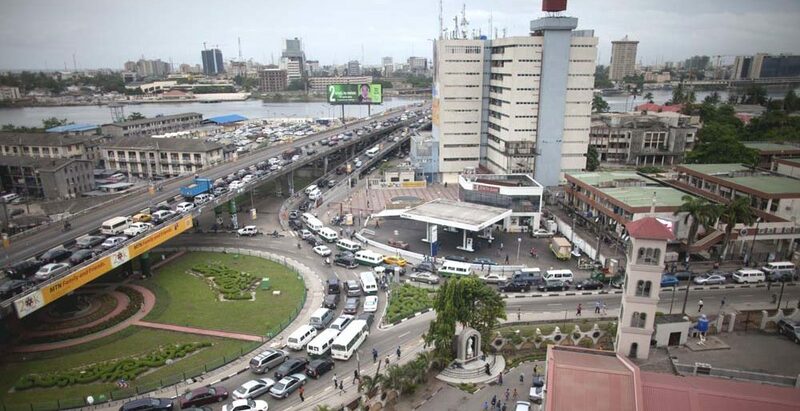 PUNCH Metro learnt that the 41-year-old victim was on his way to work when he joined a cab along the Lagos-Ibadan Expressway en route to Lagos Island. He was said to have been attacked at gunpoint, as the assailants, which included Godwin, allegedly dispossessed him of his ATM card and N4,000. However, during the incident, the policeman’s ID card allegedly fell into the luggage of the victim, who was rushed to the Lagos State Accident and Emergency Centre at Toll gate, Ojota, where he was admitted and treated. One of those who rescued Henry told PUNCH Metro that he was stabbed with a sharp object in the back. Our correspondent, who visited the centre, confirmed that Henry was indeed admitted to the facility. A worker, who spoke on condition of anonymity, said incidents of car robberies, aka One Chance, had become regular in the area. She said passersby and sympathisers, who sighted victims of such attacks, sometime called the emergency toll-free lines through which the centre got notifications. 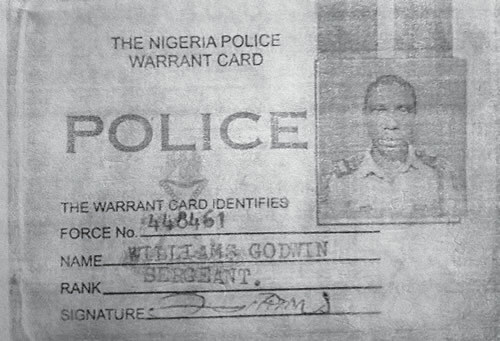 Our correspondent gathered that Henry took away the original ID card of the policeman. PUNCH Metro visited Henry’s residence in the Ogba, Agege area to speak with him on his encounter with the bandits. The house gate was locked, but a resident later showed up. The resident, who confirmed the attack, said Henry had decided not to talk about it. Another neighbour, Ben, declined to release Henry’s telephone number, saying he had put the robbery behind him. Our correspondent, however, gathered that there had been a surge in the number of victims of One Chance robberies along the Berger/Secretariat/Toll gate ends of the Lagos-Ibadan Expressway. Some of the victims, our correspondent learnt, were admitted to the Accident and Emergency Centre. In the course of investigating Henry’s attack at the centre, our correspondent sighted a victim who worked with a popular club on Lagos Island. The man, who identified himself only as Dotun, said he was attacked by a nine-man gang. He said, “I was going to my place of work at Obalende when I entered a Vanagon bus at the Berger end of the expressway around 6am on October 25. We were about nine on the bus, including a man who wore a tie. He sat in the front. All of them were hefty men and wore regular clothes. The hospital source told our correspondent that a woman had also been attacked in a similar manner three days before Dotun’s attack. She said the victim was stabbed in different parts of her body and all her money was collected. Police cordon off an area outside the Value Centre in Springfield after a shootout with would-be cash-in-transit robbers. Six suspected robbers died in Durban on Monday after two separate gun battles with police in a chase that spanned several city suburbs. The shootings and dramatic car chase were the results of a botched cash-in-transit heist. A gang of armed men attempted to rob a cash-in-transit vehicle outside the Value Centre in Springfield. A well-placed police source said that members of the Crime Intelligence Unit and the Hawks had acted on a tip-off about the heist. Along with heavily armed tactical police from the National Intervention Unit‚ they engaged the gang of men at Springfield Park’s Value Centre. Gunmen and police exchanged fire‚ leaving one man dead and another critically wounded – who later died in hospital. The fleeing robbers then led police to the scene of the second shootout in Parlock. Rescue Care spokesperson Garrith Jamieson said paramedics had declared four men‚ understood to be robbers‚ dead at the scene. He said four other civilians were injured in the crossfire. They appeared to have been sitting on the roadside having lunch when the fleeing gunmen crashed their car nearby – with police hot on their heels. The police authorities have detained three policemen following the reported theft of household items at the former residence of ex-President Goodluck Jonathan in Gwarimpa Estate, Abuja. Our correspondent gathered on Monday that the policemen would soon face orderly room trial after which they would be dismissed from service for theft. A source, who is familiar with the investigation into the case, said that the policemen who were guarding the residence had admitted to selling some of the items which they allegedly stole from the house. The source identified items allegedly stolen by the policemen to include expensive furniture, television sets, refrigerators, split air conditioners, bowler hats, designer suits and some Ijaw attire. It was learnt that the process of easing the men out of service for gross misconduct would soon be finalised. “The investigation into the theft is almost concluded and it is certain that the policemen involved in the case would be eased out of the service for gross misconduct. How can they steal what they were meant to protect?” the source stated. “The policemen who are supposed to be on guard duty at the house have been detained for questioning. Investigation to find out what actually happened is currently in progress,” the statement by the police spokesman, Anjuguri Manzah, said. Meanwhile, the command has warned against unlawful protest in the FCT, noting that some disgruntled elements planned to block major roads in Abuja.